There are two types of asscher cuts for diamonds and gemstone rings, which is the standard and the royal. 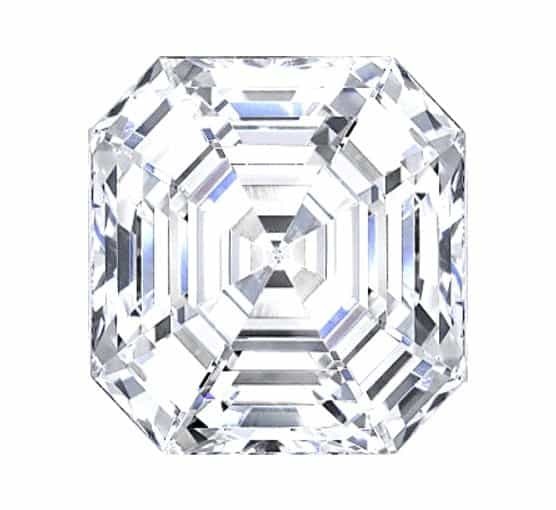 The standard asscher cut was developed by Joseph Asscher in 1902 while the royal asscher was created by an Asscher ancestor in 2001. The standard asscher has 58 facets with a small table and high crown. The royal asscher has 74 facets with a higher crown. 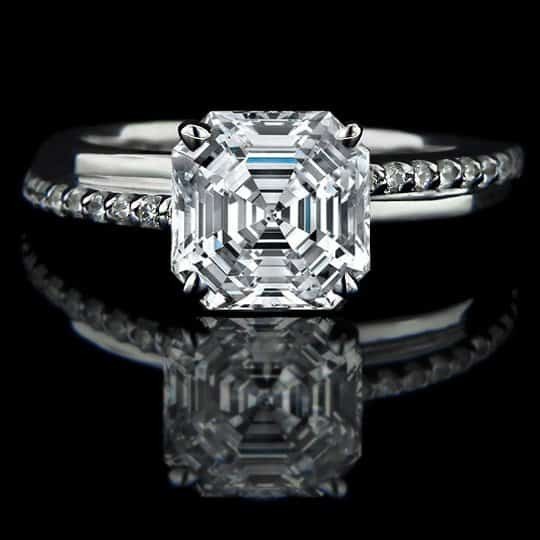 The asscher cut is known for its flash and brilliance. The deep cut of the asscher rivals the emerald cut, which is why the asscher cut is often called the square emerald. For those who love the asscher cut, they have the option of choosing a gemstone instead of a diamond. 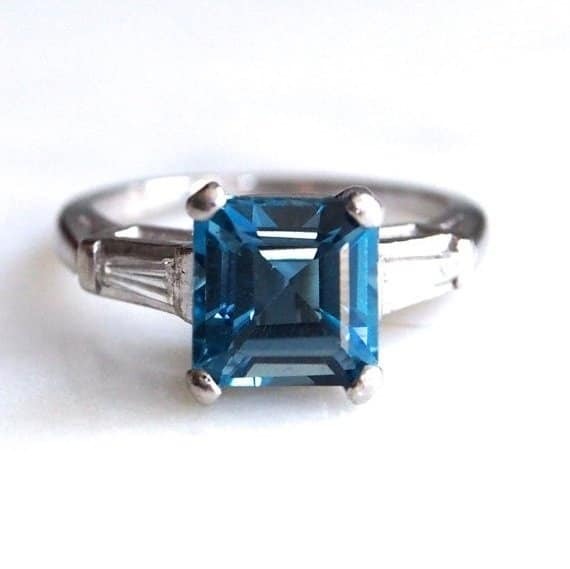 The gemstones that look best with asscher cut are aquamarines, sapphires and rubies. 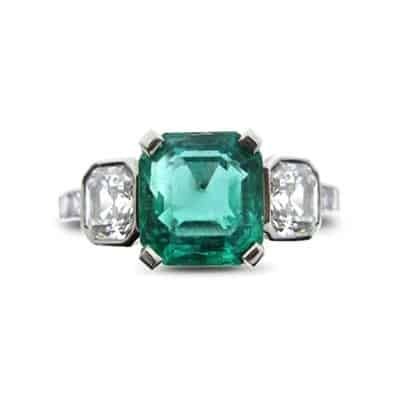 You’ll often see gemstones with an asscher cut because the cut brings out that brilliance and fire. Often, a quality diamond with a large carat will be a colored stone, not a white or colorless diamond. This allows a potential diamond ring customer to choose a unique color instead of a white diamond. An asscher cut diamond, whether it’s a white diamond or a color, needs to be high quality because the cut and facets allow the flawless nature of the stone itself to shine. 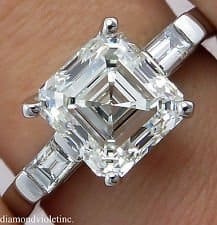 Many people who end up purchasing an asscher cut diamond do so because it’s work-friendly for those who have a job where they might bang the ring against other objects. For example, a person who works in a kitchen might have to remove their ring if they’ll be banging around with pots and pans. The asscher cut doesn’t have any edges that can cause issues. With some diamonds, the prongs can break and the stone can become loose. That won’t happen with the asscher cut. Whether you want a unique style that is actually vintage or just looks vintage, the asscher cut brings to mind the Art Deco style of the 20s and 30s. It looks great with a halo of pave stones, tapered baguettes or simple surrounding of gemstones along the band. Many asscher cut diamonds look great with intricate, stylish bands. While some might view the royal asscher cut as a disadvantage of the style of cut, others see it as an advantage. It’ll ensure that you have a unique ring style that is hard to replicate for everyone. The master cutters at the Royal Asscher company are trained by a company that first created this type of cut back in the 1900s. When you realize that the asscher cut has been around since the 1900s, you’ll also realize that it’s had quite a few revivals that make it a lasting style. In fact, a new asscher might look vintage enough to pass as an heirloom that’s been passed down through the generations. This means that you could purchase an asscher cut now that will still be relevant when your children’s children are getting married. One of the biggest drawbacks of an asscher cut diamond is that it can show all the blemishes and inclusions. The cut of the stone will expose and highlight any flaws as if they were glaring mistakes. Even small flaws that wouldn’t be seen in another cut will be clearly visible in an asscher cut. This kind of cut has to be done by a master gemstone cutter who has many years of experience. If they are done by someone who is not as talented, you could end up with a stone that is not as beautiful. It could end up with inclusions and flaws. A 1 carat asscher will look a bit smaller than a 1 carat diamond of another cut. That’s because most of the weight of the asscher is underneath, not on the surface. If you compare a 1 carat asscher with a 1 carat round cut, you’ll be able to see a significant difference in size. When choosing an asscher cut, you’ll have to ensure that you are buying a clarity and color that is within certain grades. The GIA color scale of D through H are vital for a good looking asscher cut. Clarity should be between VS2 and Flawless on the GIA scale. Any colors or clarity below that won’t look good in an asscher cut. 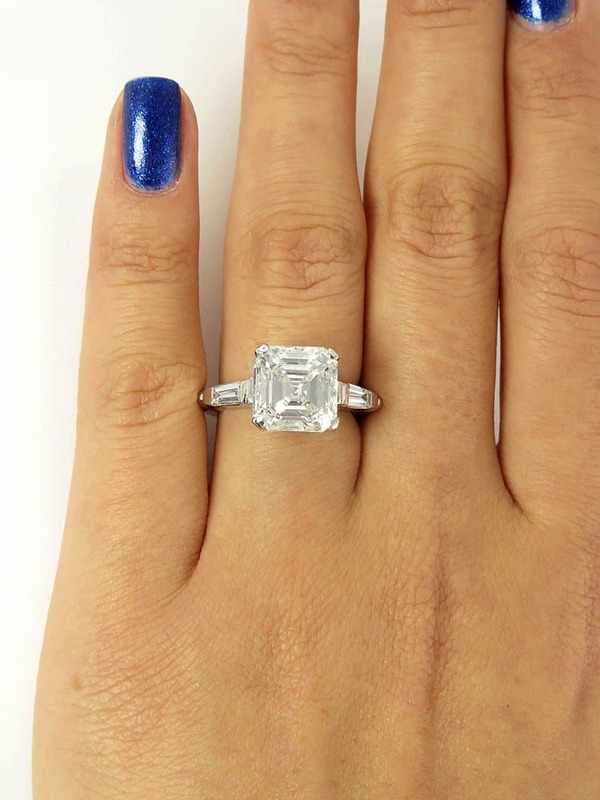 The asscher cut is one that has had a resurgence in its popularity more than once throughout the years since it was first created in the 1900s. Those who want to purchase a unique style that will stand the test of time can’t go wrong with a stunning asscher cut.